Story originally appeared on the Washington Post. Intercepting communications overseas has clear advantages for the NSA, with looser restrictions and less oversight. NSA documents about the effort refer directly to “full take,” “bulk access” and “high volume” operations on Yahoo and Google networks. Such large-scale collection of Internet content would be illegal in the United States, but the operations take place overseas, where the NSA is allowed to presume that anyone using a foreign data link is a foreigner. Outside U.S. territory, statutory restrictions on surveillance seldom apply and the FISC has no jurisdiction. Senate Intelligence Committee Chairman Dianne Feinstein (D-Calif.) has acknowledged that Congress conducts little oversight of intelligence-gathering under the presidential authority of Executive Order 12333 , which defines the basic powers and responsibilities of the intelligence agencies. John Schindler, a former NSA chief analyst and frequent defender who teaches at the Naval War College, said it is obvious why the agency would prefer to avoid restrictions where it can. “Look, NSA has platoons of lawyers, and their entire job is figuring out how to stay within the law and maximize collection by exploiting every loophole,” he said. “It’s fair to say the rules are less restrictive under Executive Order 12333 than they are under FISA,” the Foreign Intelligence Surveillance Act. In a statement, the Office of the Director of National Intelligence denied that it was using executive authority to “get around the limitations” imposed by FISA. The operation to infiltrate data links exploits a fundamental weakness in systems architecture. To guard against data loss and system slowdowns, Google and Yahoo maintain fortresslike data centers across four continents and connect them with thousands of miles of fiber-optic cable. Data move seamlessly around these globe-spanning “cloud” networks, which represent billions of dollars of investment. For the data centers to operate effectively, they synchronize large volumes of information about account holders. Yahoo’s internal network, for example, sometimes transmits entire e-mail archives — years of messages and attachments — from one data center to another. Tapping the Google and Yahoo clouds allows the NSA to intercept communications in real time and to take “a retrospective look at target activity,” according to one internal NSA document. To obtain free access to data- center traffic, the NSA had to circumvent gold-standard security measures. Google “goes to great lengths to protect the data and intellectual property in these centers,” according to one of the company’s blog posts, with tightly audited access controls, heat-sensitive cameras, round-the-clock guards and biometric verification of identities. or leased thousands of miles of fiber-optic cables for their own exclusive use. They had reason to think, insiders said, that their private, internal networks were safe from prying eyes. In an NSA presentation slide on “Google Cloud Exploitation,” however, a sketch shows where the “Public Internet” meets the internal “Google Cloud” where their data reside. In hand-printed letters, the drawing notes that encryption is “added and removed here!” The artist adds a smiley face, a cheeky celebration of victory over Google security. For the MUSCULAR project, the GCHQ directs all intake into a “buffer” that can hold three to five days of traffic before recycling storage space. From the buffer, custom-built NSA tools unpack and decode the special data formats that the two companies use inside their clouds. Then the data are sent through a series of filters to “select” information the NSA wants and “defeat” what it does not. PowerPoint slides about the Google cloud, for example, show that the NSA tries to filter out all data from the company’s “Web crawler,” which indexes Internet pages. According to the briefing documents, prepared by participants in the MUSCULAR project, collection from inside Yahoo and Google has produced important intelligence leads against hostile foreign governments that are specified in the documents. Yahoo has not announced plans to encrypt its data-center links. Because digital communications and cloud storage do not usually adhere to national boundaries, MUSCULAR and a previously disclosed NSA operation to collect Internet address books have amassed content and metadata on a previously unknown scale from U.S. citizens and residents. Those operations have gone undebated in public or in Congress because their existence was classified. The Google and Yahoo operations call attention to an asymmetry in U.S. surveillance law. Although Congress has lifted some restrictions on NSA domestic surveillance on grounds that purely foreign communications sometimes pass over U.S. switches and cables, it has not added restrictions overseas, where American communications or data stores now cross over foreign switches. It is not clear how much data from Americans is collected and how much of that is retained. One weekly report on MUSCULAR says the British operators of the site allow the NSA to contribute 100,000 “selectors,” or search terms. That is more than twice the number in use in the PRISM program, but even 100,000 cannot easily account for the millions of records that are said to be sent to Fort Meade each day. In 2011, when the FISC learned that the NSA was using similar methods to collect and analyze data streams — on a much smaller scale — from cables on U.S. territory, Judge John D. Bates ruled that the program was illegal under FISA and inconsistent with the requirements of the Fourth Amendment. Websites We Like is a weekly blog post that is contributed to by all the employees here at Peak Positions showcasing the best websites we stumble across. The website may be picked for it’s design, content, usability, uniqueness or any other elements we think make a great website. In this weeks contribution from the Peak staff we have websites from Abbel Associates, Christina Mrozik, Balboa Capital, Kenley Event Design, Thompson Remodeling, Paul Carlson, Scripps Health, Stadler Law Group, Threshold Recording Studio and Transics. Websites We Like is a weekly blog post that is contributed to by all the employees here at Peak Positions showcasing the best websites we stumble across. The website may be picked for it’s design, content, usability, uniqueness or any other elements we think make a great website. In this weeks contribution from the Peak staff we have websites from Marie Catrib’s, Valet, Manchester City Council, Middle West Spirits, Mount Sinai Hospital, Nationwide Insurance, Night Owl Interactive, Outline to Design, Sokolove Law and Work.no. Websites We Like is a weekly blog post that is contributed to by all the employees here at Peak Positions showcasing the best websites we stumble across. The website may be picked for it’s design, content, usability, uniqueness or any other elements we think make a great website. In this weeks contribution from the Peak staff we have websites from Gojee, Ithaca Bakery, Kassandra Bay Hotel, smashLAB, DNA 11, Columbia St. Mary’s, Chicago Criminal Defense, Journeyman Distillery and Liberty Mutual. Organic SEO Company Peak Positions Legal Disclosure: For the purposes of this organic search engine optimization published guideline and website policy posting, the term organic optimization "Proprietary Information" shall mean organic search engine optimization or organic SEO as all programs, trade secrets, W3C HTML code compositions, dynamic site optimization procedures, inventions, techniques, vendor relationships, advertising agency partnerships, strategic alliances, and venture capital arrangements. Our Organic SEO Company provides proven organic search engine optimization solutions in what many parties consider as the most competitive marketing and advertising sector in the world. As an organic SEO company the client domains and URLs we optimize are deemed confidential and privileged, belonging to and for the exclusive sole benefit of our clients. Peak Positions SEO Company Internet Publishing and Organic Search Engine Optimization Legal Copyright Statement is as follows: Our organic SEO company corporate attorneys in compliance with the Digital Millennium Act of 1995, The Lanham Act, and the established electronic publishing ownership copyright laws of ICANN (www.icann.org), also in compliance with the UK Patent Office 2001 Internet Copyright Legislation have worked together in publishing this organic search engine optimization disclaimer. New Internet Marketing laws have been introduced over the last 12 years giving legal protection to the right of our organic SEO firm in the digital environment; in 1996, the world intellectual property organization (WIPO) treaty made a move toward intellectual legislation leading to the following laws and amendments to be passed: the Digital Millennium Copyright Act (DMCA, 1998) in the United States, in the European Directive 2001/29/EC in Europe, which requires member states to implement the changes to their own internet publishing legislation as a result of materials, images, text, content, technology, trademarks, patents, service marks and copyrights partly because of their abstract nature can appear as just a bundle, but are protected with invisible rights. Intellectual property rights are complicated and it is easier to pretend that they do not exist and ignore them rather than try to abide by and comprehend them. Organic SEO Company Peak Positions, LLC of Traverse City, Michigan and our corporate attorneys understand that ignorance of our organic SEO company policies and natural search engine optimization services does not provide protection under the established laws. This organic search engine optimization and organic SEO company website is in compliance with new international legislation regarding copyrights and intellectual property rights and are posting this natural optimization legal disclaimer statement in an effort to better control and manage third party interaction with this website. Any duplication, reproduction or unauthorized use of any part of this organic SEO company website, its images, contents, format, designs, etc., without the express written consent of Organic SEO Company Peak Positions including the use of Peer-to-Peer network software that allows the sharing of unlicensed copies of the organic search engine optimization content published within is breaking the law and strictly forbidden by Peak Positions, LLC of Traverse City, Michigan (USA). Peak Positions SEO Traverse City, Michigan provides organic search engine optimization; the process of targeting keyword search phrases related to a website, and ensuring that corporate website properties are listed at the top of the organic search results pages when corresponding target keyword phrases are included as part of an Internet keyword search or organic keyword search query. All written organic search engine optimization materials, press releases, newspaper articles, contained herein of any nature whatsoever are subject to our organic SEO company copyright and trademark protection and shall remain the exclusive property of our Traverse City SEO company and be deemed as that by terms used in the United States Copyright Law, 17 U.S.C. Section 101, the Digital Millennium Copyright Act of 1998, and the Lanham Act. This Governing Law of Intellectual Property rights protection and organic SEO policies published on this organic search engine optimization company and natural search engine optimization firm website shall be construed and enforced pursuant to the digital copyright laws of the State of Michigan. Our Organic Search Engine Optimization company clients understand that the major search engines and directories are complex and that our proven Organic SEO company programs typically require time, unique skills, and highly specialized organic search engine optimization services required to secure and maintain prominent keyword positions on the organic search results pages of: Google, Yahoo, Bing, DMOZ.org, Ask and more. Our Organic SEO company educates and informs all clients making them well aware that only the major search engines themselves can assure website and or URL inclusion within any search engine database. In addition, the search engines are solely responsible for all keyword rankings, or specific keyword positions on the search engine results pages. Peak Positions SEO does not make any disingenuous claims, bold promises, or false guarantees that any specific domain or URL that incorporates our exclusive organic search engine optimization processes and proven SEO techniques will instantly and magically receive top five keyword positions in the user-preferred natural/organic search results pages of: Google, Yahoo, Bing, Ask.com, DMOZ.org or any major search engine, in thirty days or less. Our proven organic search engine optimization procedures are not guaranteed to deliver any specific keyword position in the natural search results or to attain any specific keyword position in the organic search results within any designated period of time, following upload and implementation. Every website is unique and is treated as such by the pre-programmed, automated search bots, crawlers and robot spiders that control any meaningful organic keyword search positions. URL acceptance levels and organic search placement capabilities can be greatly impacted by several factors, and working to gain an understanding of the collective algorithm parameters being utilized by the major search engine spiders that control organic keyword search results is vitally important if not critical to SEO success. 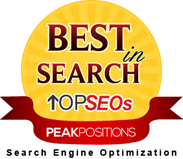 Peak Positions LLC appreciates your consideration of our organic SEO company and proven natural search engine optimization programs and invites you to contact our organic search engine optimization technical team directly by email at: info@peakpositions.com or by telephone at: 231-922-9460.